BYOB to a secret location (revealed at noon on the day of the show) and see the best comedians from around the country! You never know who might show up. Join us at a secret location to experience a diverse lineup of hilarious (secret) comedians! Our secret locations have included storefronts, residences, rooftops, and the occasional steam ship! Come to Don’t Tell Comedy have a few drinks, laugh, and meet new people. Drawing classes are back at WORD Jersey City. Bookseller and illustrator/artist Chazz Jogie will lead a five-week course this March—on Sundays for kids and on Mondays for adults—that will culminate with a mini art show in the store. This time around, students will learn how to illustrate their own comic book pages, and at the end of the course will have the opportunity to present their work in an open workshop. The class price includes all necessary materials for the session (sketch pad, pencils, sharpener, and eraser) as well as a small snack for the kids’ classes. Classes are available à la carte or as a full course. Kids’ classes begin on March 3 and adult classes begin March 4; the kids’ class will run from 2 to 4 PM and the adult class will run 7 to 9 PM. Members of WORD’s Inner Circle program will receive their usual 10 percent discount. How does one Puerto Rican woman rise from public housing to become a Pulitzer Prize winner, despite an apathetic Virgin Mary, tragic loss and an epic downpour of bird poop? This one-person show cycles through eight moments in one Boricua’s life to explore how imagination and humor help her survive and achieve despite struggles and haters—most especially herself. Each of the eight monologues suggests a different setting and stage in the speaker’s life. The show is loosely autobiographical, inspired by the playwright’s own journey to overcome “brown shame”, her lack of faith and the loss of her infant son. Nancy Méndez-Booth is a writer and spoken word performer, and teaches writing and Latinx literature and culture at colleges and universities in New York and New Jersey. She grew up in NYC public housing, where shy brown girls were taught to be quiet and not to aspire to attend Amherst College nor complete two graduate degrees (both from Rutgers-Newark). Her writing has appeared in print and online, most recently in Kweli Journal, as well as Poets & Writers, Salon, OZY, VIDA: Women in Literary Arts, her blog (nancymendezbooth.com/blog), and is forthcoming in the Latina Outsiders: Remaking Latina Identity anthology, to be published in 2019. Nancy has performed at Northeast venues including The Moth, Cornelia Street Cafe and Midtown International Theatre Festival, and “Brown Privilege”, one of her most recent pieces, is available for viewing online. Get outside and get some fresh Eire: Ride your bike with us in the Jersey City St. Patrick’s Day Parade! On Sunday, March 10, the Bike JC contingent will once again ride along with the floats and marching bands in this traditional and fun event, which also serves as our informal kickoff for the peak biking season. Check-in for riders starts at 11:00 a.m. on JFK Boulevard between Belmont and Bentley Avenues at the east end of Lincoln Park. The parade steps off from there around noon and rolls north along JFK to the reviewing stand in Journal Square, with a party there afterward inside the grand and historic Loew’s Jersey Theater. Riding in the parade is slow, informal, and not at all strenuous; mostly we ride leisurely patterns around the boulevard and other marchers, smile, wave to the crowds of spectators, and, of course, WEAR LOTS OF GREEN! Developer Manhattan Building Company Releases 60 Homes Within Six-Story Luxury Building at 100 Paterson Plank Road. A unique offering of 60 luxury condominiums in a building expressly redesigned to combine industrial flair with an ultra-health and wellness lifestyle has been released for sale at The Cliffs Collection, a converted factory now featuring expansive loft-style residences set against the tranquil Basalt Cliffs lining Jersey City’s Hoboken border. The sales launch follows the completion of a comprehensive modernization program at the five-story building which includes a new suite of amenities that incorporates elements of Blue Zone Living, a lifestyle concept emphasizing a balance of diet, good habits and social engagement to initiate healthier, happier and longer lives. Available for quick delivery, the newly-released studio-to-four-bedroom condominiums feature open floor plans ranging from 570 to 2,200 square-feet of soaring living space at introductory prices starting from the $500,000s. Residences are fully customizable, allowing for buyers to work with in-house designers or on their own to tailor their new home with myriad of selections and options – while still enjoying near-immediate occupancy. 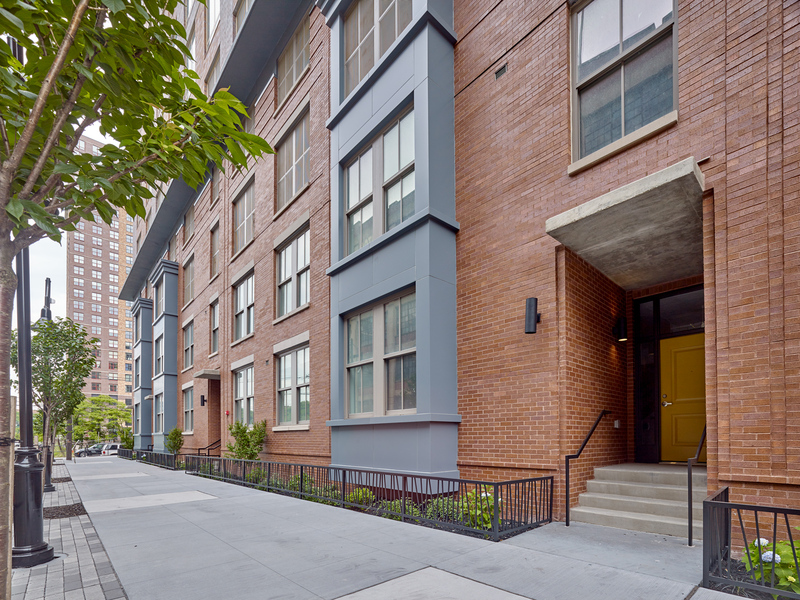 Located at 100 Paterson Plank Road in Jersey City, the pre-war building began life in the early 1900s as a boiler factory, and its classic exterior has been restored as part of its rebirth as a signature landmark residential building. A creative suite of recreational and social amenities at The Cliffs Collection include a fully-equipped fitness center with Himalayan salt sauna, residents-only lounge and library with fireplace, children’s playroom and an industrial-inspired lobby with concrete floors and adorned with historic photos of the building. Outside, a private urban oasis awaits with an updated courtyard with roofdeck and lounge, beautifully landscaped Zen Garden and hammock area, and an outdoor kitchen with gas grills, fire pits and water features all uniquely set against the breathtaking geological cliffs that nearly touch the building’s western edge. Residents will also enjoy 24-hour concierge service, bike storage and secured, covered on-site parking. The pet-friendly building also provides a dog run. To promote a healthier lifestyle, residents have access to the onsite Sancri Wellness Center, a holistic retreat that stimulates Blue Zone Living with body treatments, yoga room with yoga and meditation classes, as well as a complete wellness events calendar featuring nutritional speakers, health programs and more. Blue Zones are geographic regions worldwide where residents share common lifestyle traits and live exceptionally long lives. An on-site sales center and fully-furnished model home are open and available to tour at The Cliffs Collection. For additional information or to schedule a visit to tour the building, please visit www.thecliffscollection.com or call 201-222-0920. A recent WalletHub study recently named Jersey City ‘the nation’s most ethnically diverse city,’ making this yet another proud Jersey City moment for the books. In order to identify the most ethnically diverse places in America, WalletHub compared more than 500 of the largest U.S. cities across three key metrics: ethnoracial diversity, linguistic diversity and birthplace diversity. JC took the number one spot for the third year in a row. Pretty cool right? To see which other cities made the list, click here.